Yesterday, after our enjoyable visit to the market at Revel, we stopped in at the Lac de Lenclas for our picnic lunch of aligot [a regional potato and cheese goop mixed with a rowing oar] and some chiffonade [paper-thin sliced ham]. The lake itself is a dammed fishing lake nestling in a bend of La Rigole, the purpose built canal that feeds water into the much larger Canal du Midi. There is a restaurant and rugrat play area on site but our attraction is the population of Odonata. We’re in an irritatingly unsettled weather system à ce moment but the day was half way reasonable so we thought we’d see who we could find. As we were working our way through our aligot lunch, a man appeared to be having some kind of bonfire. We couldn’t actually see the fire, which was behind his car from where we sat, only the rising smoke and heat haze were visible. Adjusting our viewing angle, we could see that he was setting fire to some seriously sized pieces of ex-tree in a large metal trough. Curious, we thought, then, having finished our lunch, set off around the lake in search of Odos leaving him to his fire. When we returned, the fire was well under way and the man had been joined, not only by another man together with a couple of glasses of beer, but also by an entire pig – well, entire except for the head – which was now rotating slowly on a spit about 1m/3ft above the fire. 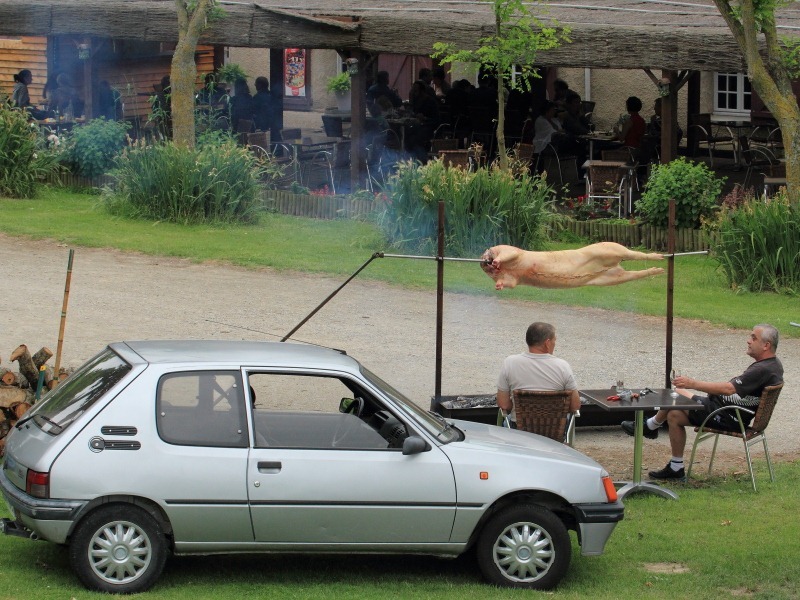 Hog roast French style – how splendid! One useful technique when watching Odos, particularly in an Odo-rich area, is, rather than chasing them ,which can tend to scare them off, is to stand still and wait for them to come to you. Though this wasn’t the conscious thought involved, one did settle on the track near Francine’s feet as she was standing still during our tour of the lake. Fortunately, not only did she have the correct lens mounted (the longer one, 75-300mm) but she’s just about tall enough for her feet to be a little beyond the lens’s minimum focus distance. Snap; snap, snap, snap, she went. The first snap was the best shot, as it so often is. Her visitor was the most interesting spot of the day. 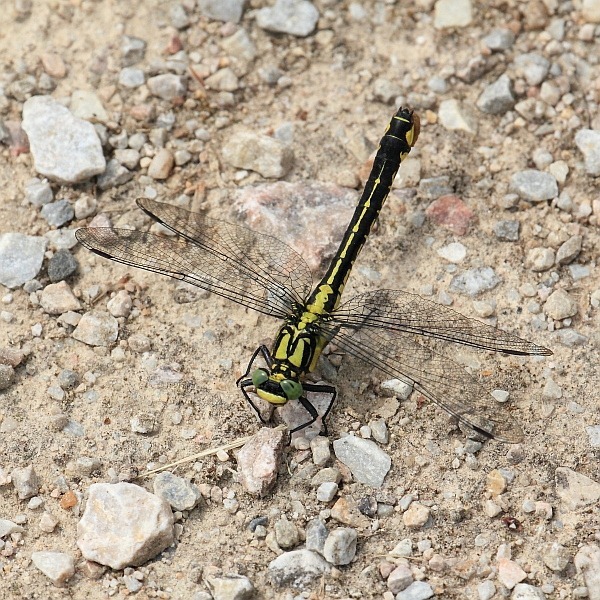 It’s a female Common Clubtail (Gomphus vulgatissimus). I’d snagged a male before on Le Loir at Luché-Pringé but I hadn’t got a shot of a female; this was our first. Females carry an egg mass under their up-curved abdomen tip while searching for a suitable oviposition site. The ball of eggs unravels into a gelatinous strand when it is deposited in flight on floating plants. I assume that this habit of carrying an egg mass on their abdomen is the very reason these dragonflies are called Baskettails. 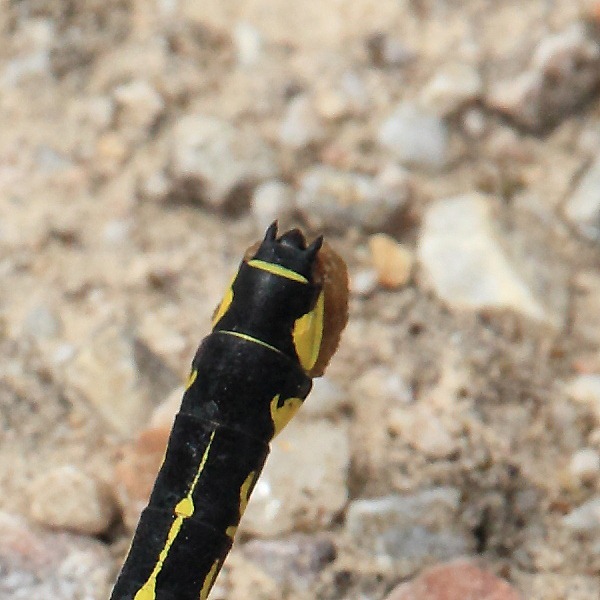 I can’t find any similar comment concerning Clubtail dragonflies but could this be what is shown in our picture? We suspect it is an egg mass, though I’ll need to consult other authorities at a later date.